WOW! These are the NEW (Copyrighted 2017) versions of the famous 2007 posters created by a graphic artist who has a passion for PDNY, FDNY & US Military history. Both the NYPD & FDNY posters have been updated and improved & are offered for sale at a mere $12.00 each, plus S&H as outlined below. 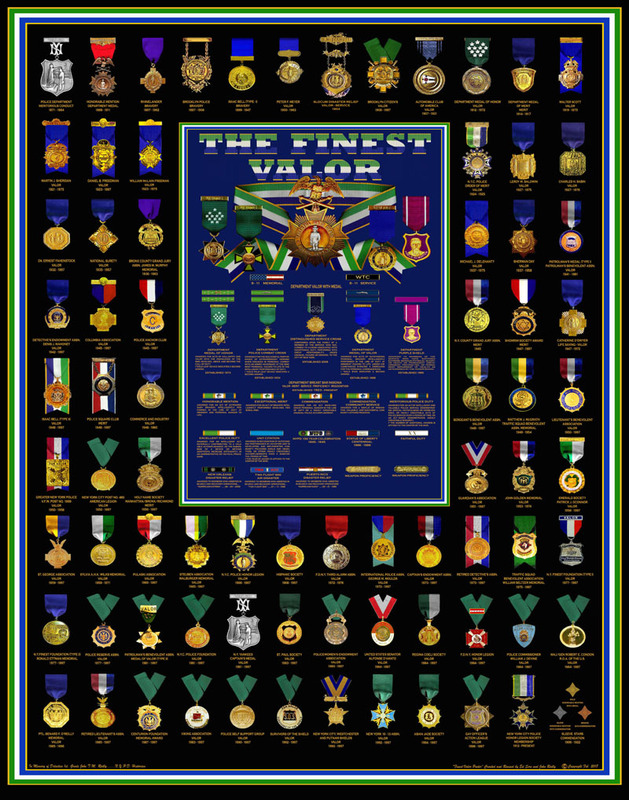 Purchase the “Complete Chronological Posters of the Medals of Valor” here, now, today! 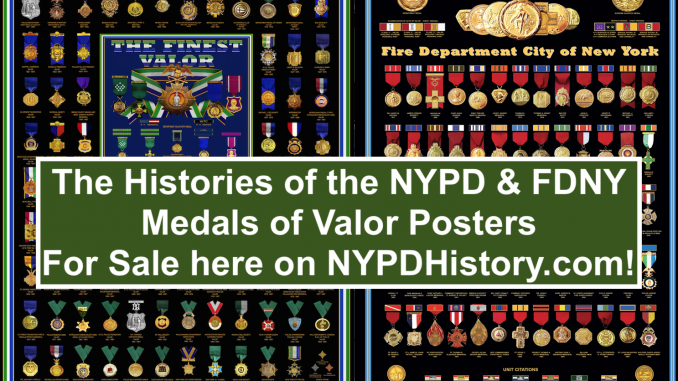 The poster encapsulates the history of NYPD medals since 1871! The center (blue portion) contains the current NYPD system of recognition for valor. That box is surrounded with amazing images (with dates issued) for every New York City Police Department-authorized medal from 1871-1997! What a great gift for that NYC police or other police officer, police supporter, or police collector! No NYPD Station-house should be without at least one! Spend some of that “Precinct Club” money on what will be a conversation piece and source of pride in tradition! A great item to trade/share with officers from other departments during this year’s National Police Memorial Week! Want to read the authoritative history of the evolution of the NYPD’s Department Medal of Honor? Click here A new browser window will open. Similar to the NYPD poster, this incredible poster captures every medal issued, including unit citations! 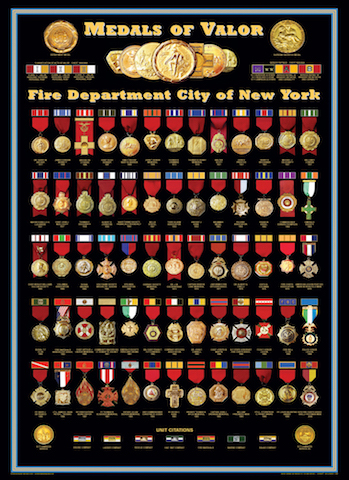 The dimensions of the FDNY poster are 24″ W x 36″ L – only one (1) will fit in a tube. The NYPD posters are shipped in a USPS-approved shipping tube 24″ in length which will accommodate 1-3 posters! The actual cost of the poster and shipping is being charged. 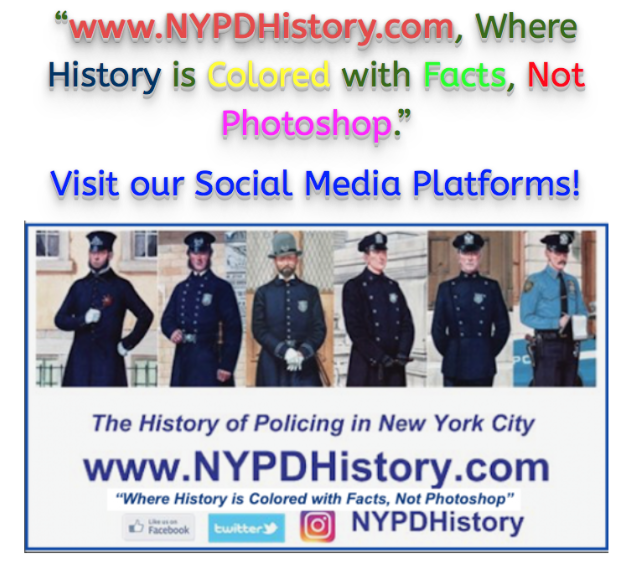 The cost is $6.50 for one (1) poster and 0.75 cents for each additional poster up to three (3) for NYPD, so buy more than one and share them with friends. Shipping for the NYPD poster is, in one (1) tube: 1 poster = $6.50, 2 = $7.25, 3 = $8.00. Shipping for the FDNY poster is, in one (1) tube: 1 poster = $6.50. Shipped vis USPS within USA within 3 business days of receipt of payment by PayPal (only). No Returns.